I can't get enough of Webster Pages Paper. 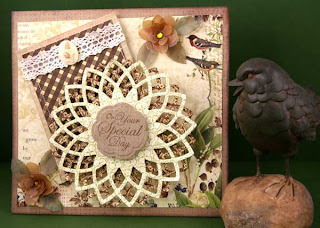 It makes a card so easy to make and I love the vintage look it gives. I started with a Neenah white card stock 6.5x5.5. After I trimmed the Webster DP down to 5.5 x 5 I cut a piece of Basic Grey Craft paper for a border. I trimmed the 6x6 paper to fit the cardstock. A contrasting piece of the Webster Pages Paper (the brown check) was cut and again I use the BG Craft Paper for a border. (love that paper). After gluing it, I stitched along the edges and added a piece of lace, and a Webster Page Silhouette that had been antiqued. The Lotus Pendant was used to cut out 2 more pieces of the Webster Pages Paper. I offset them a bit and popped them up with a Therm -O Web Dimensional. I used my Copic Air Brush system to spray some vellum a light brown and then Martha Stewart's Punches were used to make the flowers. 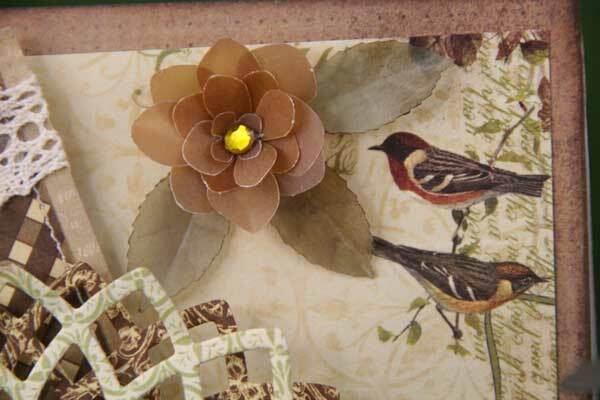 You can read Selma's Tutorial here on how to do the vellum flowers. They were easier for me this week and I liked how they turned out. What do you think??? The On Your Special Day sentiment from the new JustRite Birthday Sentiment Set was perfect for this card. I stamped it on the Basic Grey Craft Paper and cut it out using the Dahlia Spellbinders Die. This card is gorgeous! You are an amazing card maker Joan! I actually had this paper in my hand yesterday and though how perfect where the words when I was creating a wedding card then thought the young couple might not like that vintage look. Wish I would join in but I have never used a Nestabilities die yours is simply gorgeous!!! Wow wow wow so pretty! Gorgeous card! I can't wait to use some of the vintage papers I just bought from you. They are fantastic.